Stock photo of ice formations of the Mistaya River, Mistaya Canyon during winter after fresh snowfall, Icefields Parkway, Banff National Park, Canadian Rocky Mountains, Alberta, Canada. 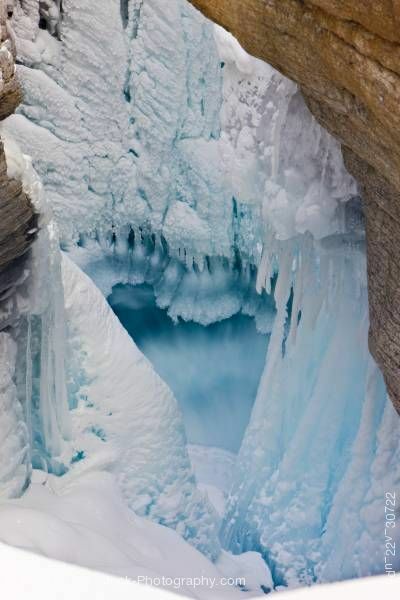 This stock photo shows ice formations in the Mistaya River in Mistaya Canyon during winter after fresh snow fall in Banff National Park, Canadian Rocky Mountains, Alberta, Canada. Banff National Park forms part of the Canadian Rocky Mountain Parks UNESCO World Heritage Site. The blue and white ice form a heart shape cutout in the frozen river water.